Want 'em? They'll go to the swift. Until Feb. 25, 2014, (or while supplies last), all our Yoders meats listings, to include the famous Yoders Bacon, is discounted. If you are a buyers club member, that gets you a total of 29%-off! See all our long-term storage meats here and get invested in your future. Did you see the news stories last week of the increasing food prices? As your luck would have it, we still have TWO DAYS LEFT on the special savings we negotiated with our distributor on all Yoders meats. Until Feb. 25, 2014, (or while supplies last), all our Yoders listings, to include the famous Yoders Bacon, is discounted. If you are a buyers club member, that gets you a total of 29%-off! Another recent story (from a week ago), CBS: "Food prices soar as incomes stand still" They mention bacon prices ... Yoders canned bacon on sale for the next couple of days. There is only one way to effectively store coffee for the long haul ... that is, as green coffee beans in vacuum sealed cans. We've got it for you, at member discounted pricing--inventory is very limited at this price. Limited Number of Lifetime Buyers Club Memberships at Just $10! This is a rare opportunity to get a Safecastle buyers club membership for just $10!! These lifetime club memberships (never a renewal fee) are normally $49. We are limiting the number of coupon codes to the first 50 new members, so don't delay. NOTE: Please purchase the membership first before adding anything else to your cart. Then wait till you receive an email from us that says "Membership Complete." At that point you can log-in to the store and see your member discounted pricing and start enjoying all the benefits and incentives that come with club membership. 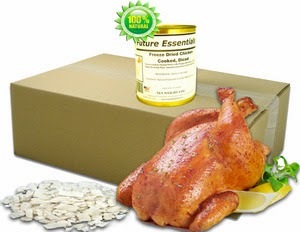 Act Fast on This ... Freeze-Dried Pork Chops and All Yoders Meats! Another great deal just dropped in our laps and you can take advantage if you are quick enough. We've been allocated just 50 cases of surplus freeze dried pork chops again. Last month, a similar allocation sold out in a matter of hours. Someone called these chops "carnivorous gold." They are definitely the most popular, fastest selling item we've had in our store. NOTE: Our allotment is not due to arrive to the warehouse until two weeks from today. So we expect to ship our allotted 50 cases of customer orders out at the end of February, but we are selling them out now. For the next two weeks only, our distributor is cutting us a special deal on Yoders meats. 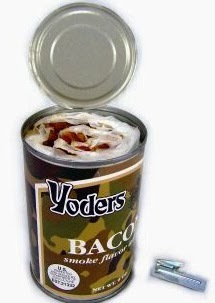 So until Feb. 25, 2014, (or while supplies last), all our Yoders listings, to include the famous Yoders Bacon, is 11%-off. If you are a buyers club member, that 11%-off is in addition to your standard club discount! Our Mountain House Rewards Program is Back Too! 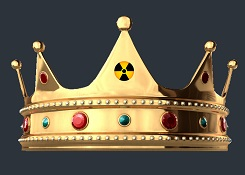 FYI, we've got one of our famous MH cans sales brewing (launching very soon) and today we've brought back our unique MH Royalty Rewards program that makes purchasing your MH food at Safecastle a no-brainer. Yep--when you combine all the available discounts and incentives at Safecastle, there's not a more cost-effective way anywhere to seriously build up your preparedness. 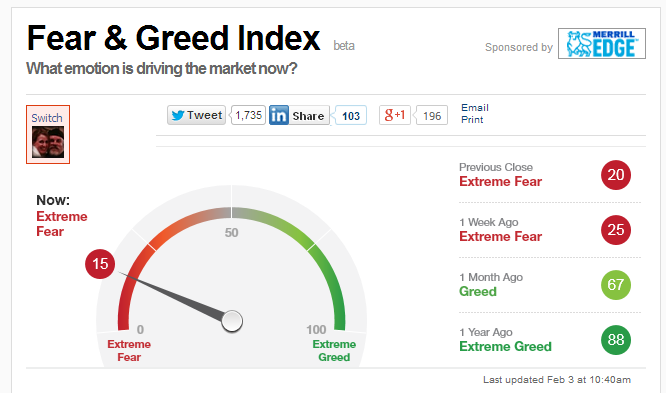 "Fear & Greed Index" Burying the Needle in "Extreme Fear"
Been watching this lately ... now close to burying the needle in "Extreme Fear." Click here for the 7 indicators on which this index is currently built and updated.